Hanger Barn by Folio (Youngsu Lee and Bosuk Hur). Pending approvals and fundraising, this temporary art structure will be assembled on Governors Island and open to the public for the summer 2016 season. The annual competition is hosted by FIGMENT, the Emerging New York Architects Committee (ENYA) of the American Institute of Architects New York Chapter (AIANY), and the Structural Engineers Association of New York (SEAoNY). The City of Dreams Pavilion, so named for its focus on the future of a world that faces strains on both economic and natural resources, aims to promote sustainability-oriented thinking amidst the architecture and design communities. The competition requires designers to consider the environmental impact of their designs in everything from materials sourcing to disposal (or ideally reuse) of waste at the end of the season. Folio’s proposal for the Hanger Barn turns recycled clothes hangers into a pavilion using modular design techniques. It also creates the illusion of motion due to the placement of the hangers in fractal patterns, which create shadow effects on the ground below that change with the movement of the sun. The modular design is composed of the hanger’s original triangle shape, rotated and paired with mirrored segments that connect with zip ties. The intention is for the materials to be reused after disassembly at various sites around New York City. Folio will work with FIGMENT, ENYA, SEAoNY, and Governors Island to select the exact site for Hanger Barn, refine the design, obtain necessary approvals, and fabricate and install the pavilion on the island. 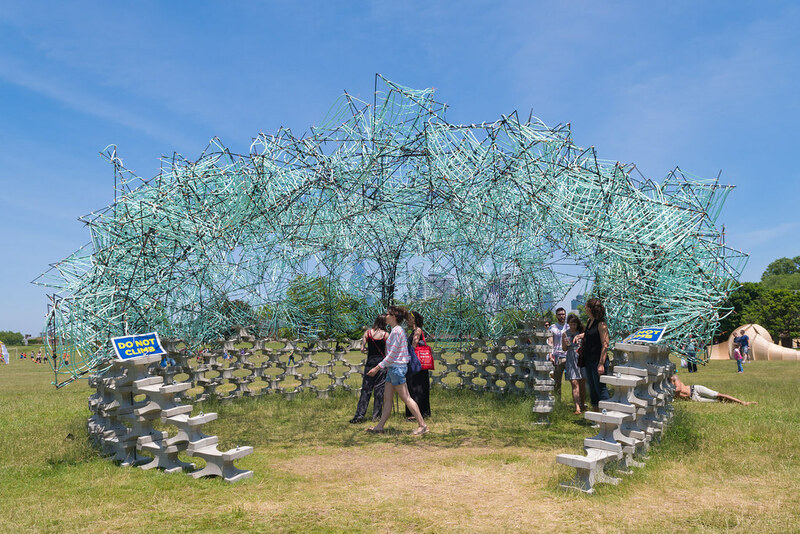 FIGMENT is accepting tax-deductible donations to support the fabrication, installation, and maintenance of the pavilion on Governors Island for the 2016 summer season. Donations can be made by following the link here: http://www.figmentproject.org/donate. The project will likely also be launching its own funding campaign. Check out our webpage for more information on the City of Dreams Pavilion! Summer-Long Minigolf and Sculpture Programs Now Accepting Submissions! Calling all artists! Submissions are now open for two 2016 summer-long programs: Minigolf and Sculpture! 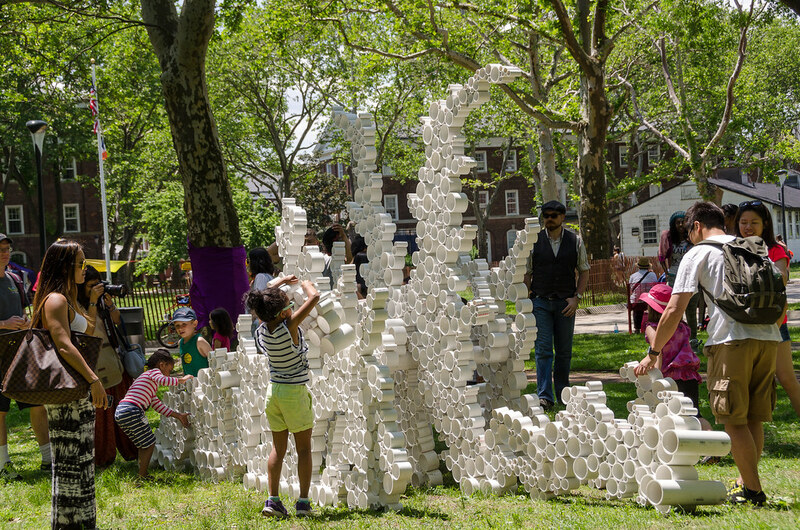 FIGMENT NYC hosts a number of summer-long programs on NYC's Governors Island. From June through September you will find these wildly creative, original exhibitions on the island. They are all FREE for the public to enjoy and interact with while the island is open. We are currently accepting submissions from artists who want to participate in these exciting programs in 2016. The Pavilion is a gathering place, a site for people to learn about the arts programs on the island, enjoy performances and lectures in the shade, and interact with the historic context of Governors Island. FIGMENT teams with the Emerging New York Architects Committee (ENYA) of the American Institute of Architects NY Chapter (AIANY) and the Structural Engineers Association of New York (SEAoNY) to host this annual competition. The challenge: design and construct a temporary pavilion on Governors Island that meets the criteria outlined here. These eye-catching structures are always highlights of the FIGMENT NYC season, and the 2016 contest winner will be our 6th Pavilion! Do these beauties look familiar? 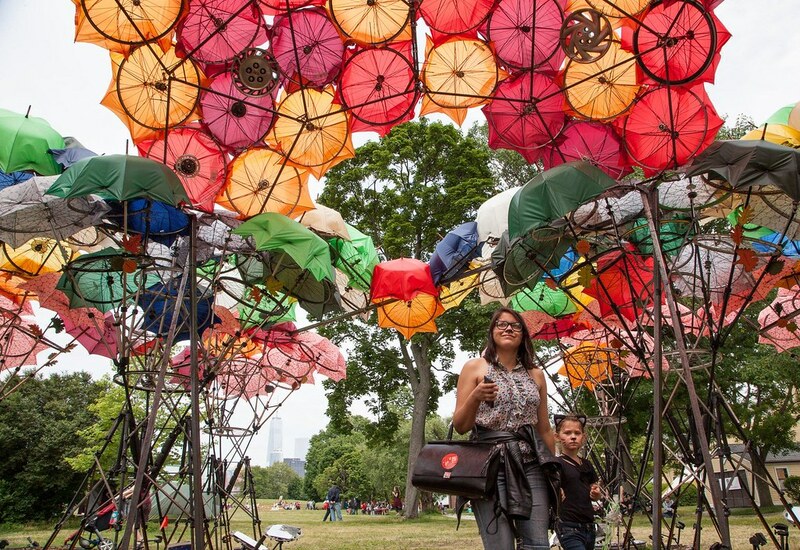 They're the 2015 winners, currently installed on Governors Island through the summer. Don't Let the fun stop when that last ferry docks! Come to the historical Hideout Bar inside Fraunces Tavern TONIGHT for the official FIGMENT NYC afterparty. Help us celebrate a successful 9th annual FIGMENT, meet your fellow participants and artists, and let loose! Happy Hour drink prices from 5-9pm. Enter on Broad st and Water st, just one block from the Governors Island ferry! Everyone is welcome. FIGMENT NYC Opens This Weekend! This Saturday and Sunday, June 6th and 7th, join us on Governor's Island for our 9th annual FIGMENT NYC Weekend Festival! It marks the opening of the 2015 summer season, which includes some nifty season-long programs. This weekend's event runs 10am-6pm both days, and as always is FREE. Here is information about how to get there, including a ferry schedule. Also, BIG NEWS! For the first time ever the FIGMENT app is live for Android! The 2015 information is up to date in the iPhone app as well. Download these free apps and have an instant pocket reference for your visit. And, if you love FIGMENT and want to support us, it's not too late to volunteer! We need help Friday-Monday this week and can always use a few more hands with everything from building and painting to greeting people as they arrive from the ferry. Fill out this form and one of our hardworking volunteer coordinators will be in touch to schedule you for a shift. As an entirely volunteer-run event, FIGMENT NYC is people-powered by folks just like you. We NEED your help! Whether you have a few hours, a few days, or want to become part of the team that makes FIGMENT NYC happen year-round, we hope you'll consider giving some time to this incredible event. Now that the FIGMENT NYC weekend is closing in, there are opportunities to help every day! If you want to come out and lend a hand this week fill out this form with your availability, skills, and interests and we'll connect you with a project that can use your help. If you'd like to keep abreast of volunteer opportunities in the future, fill out this general volunteer form. The FAST (Figment Art Support Team) volunteers are the team that works directly with our curators and artists during the weekend festival. We're looking for a few more friendly faces to handle tasks like artist check-in at Headquarters, roaming with curators to check on artists all over the island, and generally making the artists' experience more pleasant. If you have wondered what it's like to be one of our curators or even considered joining the team, this is a good place to start. Contact Lisa at lisamichelle@figmentproject.org to get more information or to sign up! For 2015, the City of Dreams Committee selected TWO winners: Organic Growth by Izaskun Chinchilla Architects and Billion Oyster by BANG Studio. The Pavilions are being built in many stages on and off the island, all of which need helping hands along the way. Below find the volunteer sign-up forms for each individual pavilion. The links also have info about schedules of work calls and descriptions of the tasks needed. For more general info about these incredible works of art, click here. Our F&C team will be on the Island every Friday in May as well as some other dates TBA. Fill out this sign-up form if you are interested; we are particularly looking for volunteers who have at least a little experience with (or a lot of enthusiasm for learning) construction skills! The structure is built, and now we need people who want to paint! 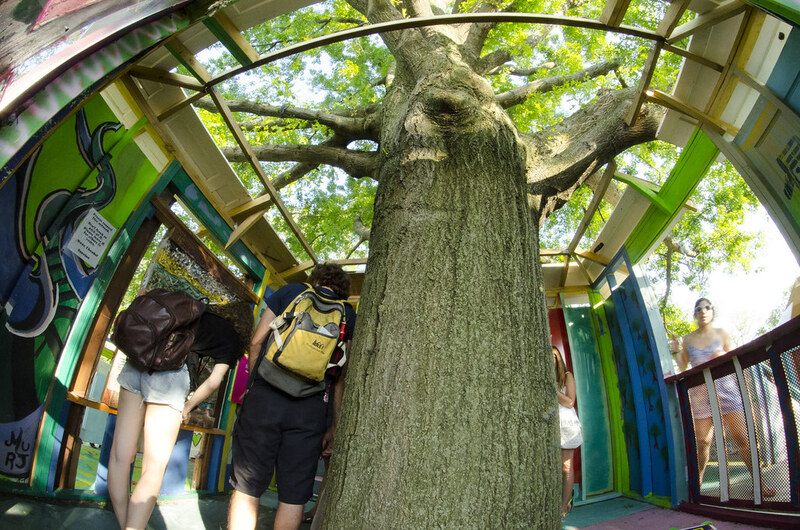 Contact treehouse@figmentproject.org to sign up, and also fill out our general treehouse volunteer form to keep up to date with future volunteer opportunities! FIGMENT NYC is always looking for drivers. Please contact volunteers at nyclogistics@figmentproject.org to make your interest known (or for more info). Call for Participation deadline extended to April 30: LAST CALL! Project submissions for FIGMENT NYC Weekend have been extended to Thursday April 30, 11:59PM ET. Now you have a little more time to get your project in for the 2015 event, but it's still only 9 days away! We want YOU, your creativity, your energy, your fun and your imagination! Join us for our annual fundraiser, Groundbreaking 2015! Want to support FIGMENT? Our annual kickoff / benefit event is happening May 4th at DROM in the East Village. A celebration of participatory, community-based creativity featuring special guests, surprise performances, exclusive raffle and auction items, dancing and honoring lower manhattan participatory art leaders Matt Goldman & Renee Rolleri, founding members of Blue Man Group and Blue School. RSVP on Facebook: Find us, and invite your friends, on Facebook! This year we selected two incredible Architectural Pavilions to be installed on Governors Island. Billion Oyster Pavilion by BanG studio of New York City and Organic Growth by Izaskun Chinchilla Architects of Madrid and London. Both projects have recently launch Kickstarter campaigns to fund the creation of their pavilions. Click here to see both campaigns and to learn how to get involved. BanG’s proposal for the Billion Oyster Pavilion joins two of Governors Island’s most exciting enterprises: FIGMENT/ENYA/SEAoNY’s City of Dreams Pavilion and The New York Harbor School’s Billion Oyster Project. The materials that form the woven canopy (steel rebar, nylon rope, and hose clamps) are used in their harbor restoration work. The base of the pavilion is comprised of custom-cast “Reef Balls,” a restoration device that the school will also use as part of their habitat creation effort. The pavilion will be donated to the Harbor School and its materials will be completely re-used on the island once the summer ends and the pavilion is decommissioned. Support their Kickstarter campaign here! Izaskun Chinchilla Architects’ design takes inspiration from nature to create an innovative and flexible solution that directly engages with local communities and familiar materials. Flower structures such as those found in hydrangeas have the ability to respond to the natural environment, growing and morphing to remain in balance with nature. Izaskun believes architecture must adopt a similar responsiveness, adapting to uncertain budgets, social change and ecological dynamics naturally, beautifully and intuitively. The proposed design employs commonly found materials, giving them a new life after they have become unfit for their original purpose. The design utilizes broken umbrellas, old stools and damaged bicycle wheels, which several institutions in New York are already recycling. As with mop-head flowers, the pavilion is composed of many smaller elements, all of which can be dismantled and re-used after the summer. Branches composed of several umbrellas and tripods, can be easily reused as sun, wind, and rain protection in outdoor spaces all around the city. Larger elements can be beautiful indoor chandeliers and can be useful for community centers or other public spaces. Izaskun Chinchilla is a Senior Teaching Fellow, Senior Research Associate and Public Engagement Fellow at Bartlett School of Architecture, University College of London. Join the FIGMENT team and community on Tues. Feb. 10 at Open House Club (244 East Houston) from 7:00-10:00 PM for our February Meet & Greet event. The FIGMENT NYC team will be on hand to share exciting updates about our 2015 Sculpture Program and City of Dreams Pavilions (yes, plural!). Bring us your questions about submitting a proposal for FIGMENT Minigolf, the Treehouse, or FIGMENT weekend, and if you're interested in, or just curious about volunteering or getting involved in FIGMENT in any way, this is a great opportunity to learn more. We'll be joined this month by the team from ALPHA; FIGMENT's weekend camping event for creators. Happening in Maryland, April 24th-26th, we use a bucolic space for workshops, skill-shares, building and burning (of art) too. Meet the ALPHA team and connect with other attendees to plan projects. Our effigy team, ALPHAGY, will be on hand as well and looking for volunteers. Learn more about the event at alpha.figmentproject.org and rsvp for the event at https://www.facebook.com/events/1539870592945929/ . As always, the good company of our amazing FIGMENT/ALPHA community is assured, so join us to round out your Tuesday with a little creative energy and great people no matter whether or not you have questions. Pleas RSVP to the Facebook event here, and please help us spread the word.